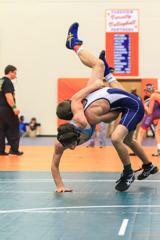 Team Georgia Folkstyle Wrestling... in a nut shell. 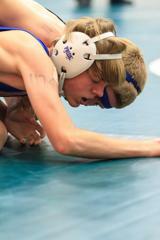 Folkstyle Wrestling is the form of Wrestling that is practiced mostly in American High Schools and Colleges. It is also known as Collegiate wrestling. Collegiate wrestling emerged from the folk wrestling styles practiced in the early history of the United States. 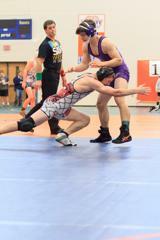 The object of Folkstyle Wrestling is to pin your opponent. Folkstyle scoring focuses mainly on changes in control. Taking an opponent down to the mat, escaping from or reversing control, or turning an opponent's back to the mat are all scoring situations. Team Georgia USA Wrestling provides opportunities for wrestlers from as young as 4 up thru College ages can compete in the events. Wrestlers will compete in standard Age & Weight Divisions. Typically the age groups are 6U (6 and under), 8U, 10U, 12U, 14U, Cadet(15&16), Junior(High School grades based), University & Open. In addition there may also be Girls brackets available. 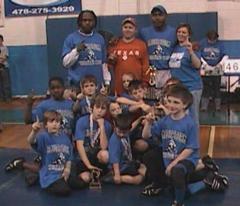 A wrestler must weigh in less than the weight class they register for or they will not be able to compete. The Team Georgia Folkstyle Season runs from September thru early March. These events are open to any wrestler from any state to participate. The start of Team Georgia Regular Season always coincides with the start of the Georgia High School Association (GHSA) official start of competition date. The differences in the seasons is only who is eligible to participate. 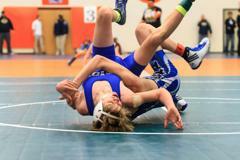 Once the GHSA official season begins, wrestlers older than 14 or enrolled in High School (9th-12 grade) are not eligible to participate in the Team Georgia Regular Season events. 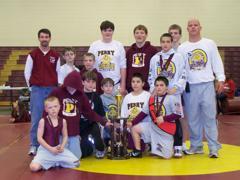 Youth Wrestlers (age 4-14 and not enrolled in High School) can participate in both Pre-Season and Regular Season events. 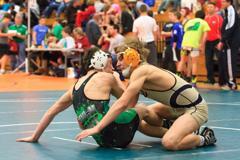 Regular Season events consist of the following types of events; Open, Beginners and Duals. 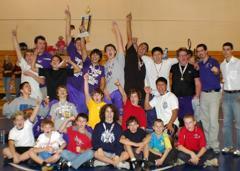 Open Events- Open events are open to wrestlers with any experience levels. Duals Events- Elementary and Middle school wrestlers may have the opportunity to compete with their Club/Scholastic Teams or Training Center Team in Duals Events. The Folkstyle season is capped off with the Team Georgia Folkstyle Championship events. These events are for Georgia State residents ONLY. Wrestlers from other states are not authorized to participate in these events. FOLKSTYLE WRESTLING - A combative sport where one wrestler tries to physically control the opponent against their will without injuring them. PHYSICAL CONTROL - To get behind the opponent's back and arms, force them down to the mat, turn them over onto their back, and pin them. To take the opponent directly from their feet to their back without getting behind them, and pin them. To counter the opponent's moves to stay in the control position. MATCH OR BOUT - When two wrestlers wrestle each other. Both wrestlers must weigh within one weight class of each other. You win a match by pinning your opponent, by scoring more match points than your opponent, or by disqualification if your opponent breaks certain rules. A MATCH in high school consists of three two-minute periods. The first period begins in neutral position with both wrestlers on their feet and facing each other. The second period begins with one wrestler choosing top, bottom, neutral, or deferring choice until the third period. The third period begins with the other wrestler choosing top, bottom, or neutral position. POSITIONS - Most sports have two scoring positions - offense and defense. 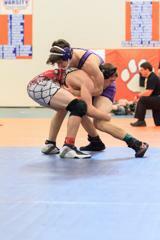 Wrestling has three scoring positions - offense, defense, and neutral. You can only be in one of these positions at a time. You can only score in certain ways from each position. Scoring match points is just improving from defense to neutral to offense to a pinning position, in that order. When one wrestler is in the neutral position, the opponent must also be in the neutral position. When one wrestler is in the offensive position, the opponent must be in the defensive position. OFFENSIVE POSITION - ON TOP - IN CONTROL - THE BEST POSITION - The wrestler who is on top of and/or behind the opponent and is physically controlling them. Also, the wrestler on top in the referee's starting position. The offensive wrestler will try to physically break down the opponent and turn the opponent's back toward the mat (45 degree angle or less) to score near fall points or to gain a fall. Only the offensive wrestler can score a 2, 3, or 4 point near fall. NEUTRAL POSITION - ON THE FEET - NO CONTROL - THE NEXT BEST POSITION - When neither wrestler has control over the other and they are both on their feet or knees and facing each other. Each neutral wrestler will try to "break balance" on the other and take them down to the mat. Only the neutral wrestler can score a 2 point takedown. DEFENSIVE POSITION - ON THE BOTTOM - BEING CONTROLLED - THE WORST POSITION - The wrestler who is underneath and is being physically controlled. Also the wrestler on the bottom in the referee's starting position. The defensive wrestler will try to get out of the top wrestler's control by escaping from or reversing the offensive wrestler. Only the defensive wrestler can score a 1 point escape or a 2 point reversal. Strategy-wise, most wrestlers will choose "down" when it's their choice of position because they feel it is easier to score an escape or reversal from this "worst position", than a takedown from neutral or a near fall from on top. MATCH STOPPED - If the wrestlers have their match stopped by the referee's whistle, the referee will return them to the center of the mat and start them wrestling again in the same neutral, top, or bottom position that they were in when the match was stopped. For example: out-of-bounds, stalemate, potentially dangerous, penalty, injury, coach's conference, or no action on the edge of the mat. STALEMATE - The referee can stop the match when both wrestlers are in a situation where neither wrestler can improve their position. POTENTIALLY DANGEROUS - The referee can stop the match in situations where one wrestler might become injured by a legal or illegal hold before the injury occurs. Safety is considered more important than scoring and the match can continue. REFEREE'S POSITION - A starting position in the center of the mat where the defensive wrestler puts their knees down on one side of one parallel line and hands down on the other side of the other parallel line. Once set, they must remain still until the referee blows the start whistle, or they can be cautioned for moving too soon. After the defensive wrestler acknowledges to the referee that they are set, the referee will signal the offensive wrestler to assume their choice of either the traditional top starting position or the freestyle top starting position. In the traditional top starting position, the offensive wrestler will place at least one knee down on the mat on the same side as they are going to touch the elbow, place one hand naval deep around the waist, place their head over the center line of the defensive wrestler's back, and LASTLY, touch the back of one elbow with the palm of the other hand, and wait for the referee to blow the start whistle. In the freestyle top starting position, the offensive wrestler will signal to the referee by raising both hands toward the referee with the thumbs touching and then the referee will verbally notify the bottom wrestler that the top wrestler is going to use a freestyle start. The offensive wrestler will stay standing to the side or the back of the defensive wrestler and place both hands with thumbs still touching on the midline of the back of the defensive wrestler and wait for the referee to blow the start whistle. To insure a fair start, either the top or bottom wrestler can be cautioned for each time they assume an incorrect starting position OR they move too soon before the referee blows the start whistle. The above details are very technical, but when followed correctly, referee's position starts go very smoothly and quickly. MATCH POINTS - Points scored during a match. There are eight basic ways to score match points in high school. TAKEDOWN - T2 - 2 points - Awarded after one of the neutral wrestlers gets behind the opponent and forces them down to the mat to their stomach or side or knees or weight on all fours OR takes them directly to their back or buttocks without getting behind them AND becomes the offensive wrestler. Neutral to Offense is a twopoint takedown. If you go from neutral to defense, you were taken down. ESCAPE - E1 - 1 point - Awarded after the defensive wrestler gets out from underneath the opponent's control and gets into the neutral position AND is facing the opponent. Defense to Neutral is a one point escape. REVERSAL - R2 - 2 points - Awarded after the defensive wrestler gets out from underneath the opponent's control and gets on top of and/or behind the opponent in one move AND becomes the offensive wrestler. To earn a reversal, you do not have to return your opponent to the mat as you would on a takedown. Defense to Offense is a two point reversal. NEAR FALL 2 - N2 - 2 points - Awarded after the offensive wrestler turns the defensive wrestler over onto their back and holds them at a 45 degree angle or less for between 2-4 seconds (2-4 counts by the referee). Also awarded when the match is stopped due to the defensive wrestler being injured and/or screaming out to stop the match (unethical unless they are really injured) while being turned toward their back (imminent near fall) before the near fall count starts or before 2 counts by the referee. Only one set of near fall points can be awarded for each pinning hold, and they cannot be awarded until after the pinning situation has ended. Defense on their Back. NEAR FALL 3 - N3 - 3 points - Awarded after the offensive wrestler holds the defensive wrestler within near fall criteria for five or more seconds in a row (5 counts by the referee), instead of the two point near fall. Also awarded when the match is stopped due to the defensive wrestler being injured and/or screaming out to stop the match (unethical unless they are really injured) after being held within two point near fall criteria (2-4 count by the referee), instead of the 2 point near fall. Defense on their Back Longer. NEAR FALL 4 - N4 - 4 points - Awarded when the match is stopped due to the defensive wrestler being injured and/or screaming out to stop the match (unethical unless they are really injured) after being held within near fall criteria for five or more seconds, instead of the 3 point near fall. Defense on their Back Longer and Injured. PENALTY POINTS- P1 or P2 - 1 or 2 points - A wrestler in any of the three scoring positions can earn one or two penalty points when their opponent breaks the rules of wrestling. These rules include no stalling (one stall warning is given before penalizing for stalling), no swearing, kicking, scratching, biting, hitting, body slamming an opponent to the mat, bending any body part beyond its normal range of motion (the referee will try to stop these situations as potentially dangerous before someone is injured), or using holds from the illegal holds list. On the penalty chart, any first penalty is 1 point. Any second penalty is 1 point. Any third penalty is 2 points. Any fourth penalty is disqualification. Unsportsmanlike conduct and flagrant misconduct can lead to immediate disqualification. LOCKED HANDS PENALTY - A wrestler in the neutral position or defensive position can lock hands around the torso or both legs of the opponent. But it is a penalty for the offensive wrestler to lock hands (except cradles) around the torso or both legs of the defensive wrestler unless the opponent is standing on their feet or within a near fall count. Overlapping fingers is considered locked hands by the referee. LOCKED HANDS AROUND THE HEAD PENALTY - It is a penalty from any of the three scoring positions to lock hands around the opponent's head without an arm or leg included. 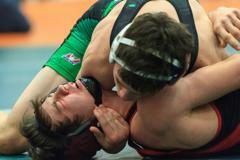 You must also allow your opponent to breathe in a headlock or the referee can stop it as potentially dangerous. CAUTION and CAUTION POINT - C and C1 - 0 and 1 point - A wrestler in any of the three scoring positions can earn one caution point from the opponent's third caution on for each time the opponent is cautioned by the referee for starting too quick before the whistle OR by lining up incorrectly when starting from referee's position or from on the feet. A wrestler is allowed two cautions before the C1 penalty points begin. Also caution points are separate from penalty points and do not count on the penalty chart towards disqualification. Scored C, C, C1, C1, C1, etc. PIN FALL - 6 team points - Awarded to the team whose wrestler holds both of the opponent's scapulas to the mat for two consecutive seconds in high school. The match is over as soon as the fall occurs, and the one who is pinned loses automatically even though they may have been way ahead in match points at the time. The referee slaps the mat when a fall occurs. You can pin or be pinned in any of the three scoring positions. 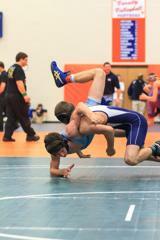 TECHNICAL FALL - 5 team points - Awarded to the team whose wrestler has scored 15 match points more than the opponent. The match is stopped as soon as the 15 point margin is achieved, except in a pinning situation where the referee will allow the offensive wrestler to try to score the fall. MAJOR DECISION - 4 team points - Awarded to the team whose wrestler wins by a margin of 8-14 match points more than the opponent has scored. REGULAR DECISION - 3 team points - Awarded to the team whose wrestler wins by a margin of 1-7 match points more than the opponent has scored. DRAW OR TIE - There are no more ties in wrestling as the match will be decided by sudden victory overtime from the feet and/or by tie breakers from referee's position. DISQUALIFICATION - 6 team points - A wrestler wins a match by disqualification when the opponent is disqualified from the match because of too many penalties OR when a wrestler is illegally injured by an opponent's illegal hold and cannot continue wrestling. If you were injured by an opponent's illegal hold (not a technical violation like locking hands or grabbing the uniform, unless it was their fourth penalty chart penalty), you will win the match by disqualification. It will not do a wrestler any good to intentionally try to injure an opponent because they will lose. INJURY DEFAULT - 6 team points - A wrestler wins a match by injury default when the opponent is injured accidentally during the match and cannot continue wrestling. FORFEIT - 6 team points - A wrestler wins a match by forfeit when the other team does not have a wrestler to compete against them. ADVANCEMENT POINTS - High School - 2 or (1) team points for each win on the championship side of the bracket and 1 or (1/2) team point for each win on the consolation side of the bracket. You do not receive advancement points for a bye unless you win your next match after the bye, unless your specific tournament allows it. Also, you do not receive advancement points for winning your 1st, 3rd, 5th, or 7th place matches. 1 or (1) extra team point for each major decision (8-14 match point victory margin). 1.5 or (1.5 with a near fall) extra team points for each technical fall (15 or more match point victory margin). 2 or (2) extra team points for each fall, default, disqualification, forfeit. Advancement points and extra margin of victory points are always added into the tournament team score after each match is completed. However, placement points are not added in, until after a win in a round guarantees a certain placing even if the wrestler loses all subsequent matches. For example: If you win a quarterfinal match in any tournament and get into the semifinals, you are guaranteed at least 6th place, even if you lost all of your later matches, and thus the 3 or (6) placement points for 6th place would be added to your team score at that time. If you win your semifinal match and get into the finals, you are guaranteed at least 2nd place, thus you would earn 9 or (6) more placement team points by moving from the 3 or (6) - 6th place points to the 12 - 2nd place points. A finals win would move you from the 12 - 2nd place points to the 16 - 1st place points, and thus you would get 4 more placement team points added in after the finals.